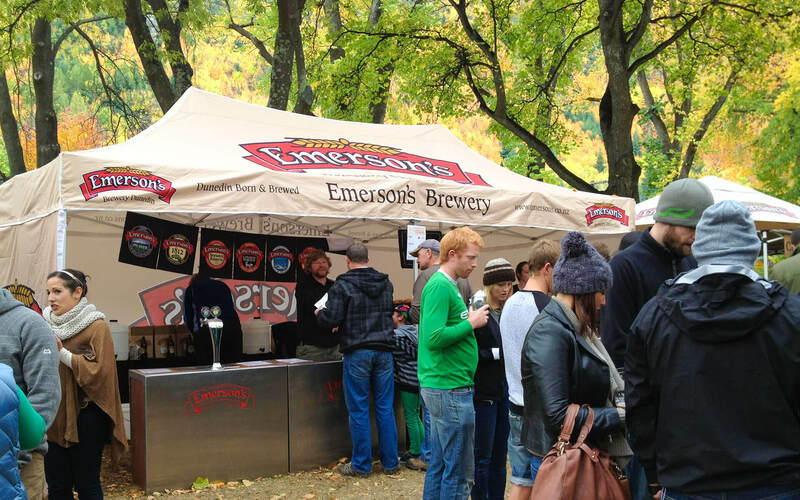 Emersons Brewery, a Dunedin based craft beer brewery, are utilising their branding opportunities through the use of a Shade7 pop up gazebo. Shade7 was approached by Emerson Brewing Company to produce a printed gazebo that would enable them to effectively promote themselves when on the move. The brewery takes part in a variety of outdoor events and festivals making it increasingly important to ensure their standard of excellence is maintained in all aspects of the business. Shade7 were able to create an Emerson’s branded pop up gazebo that would allow the company to continue a uniform brand presence in any environment. As pictured above at an event, not even some chilly weather in Arrowtown could deter punters from drinking some of their fine beer. Particularly for new customers, a branded gazebo allows Emerson’s to clearly convey who they are and what they do. Jane Hyde from Emersons endorsed that “the gazebo was great, it looked fabulous and was easy to use”. Shade7’s gazebos are designed to be easily put up or collapsed, are able withstand a variety of weather conditions and can also endure constant use. Shade7 offer a design service allowing customers to convey the right brand message for their business or organisation. Shade7 also supplied branded outdoor umbrellas to match the branded pop up gazebos. Contact Shade7 for more information.